WSDL [FAIL]: I tried to obtain an wsdl by executing Visual Studio’s wsdl.exe but I got an error saying something like "The HTML document does not contain identifying information about the Web service." Service Reference [FAIL]: On Visual Studio, I tried adding a Service Reference, providing the web service’s url. 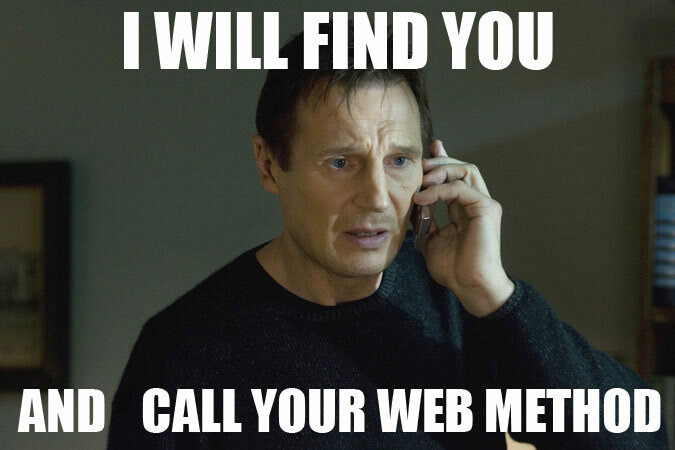 I got an error downloading '<url>/_vti_bin/ListData.svc/$metadata'. Metadata contains a reference that cannot be resolved. Maybe the web service was an ASMX instead of a WCF? SOAP [almost WIN]: My last hope on cleaning this mess was SOAP (pun intended). Indeed, I tried creating a class based on the code available here. Sadly, when Visual Studio executed that class on IE11 I got a rather random HTTP Error 403.14 - Forbidden, the Web server is configured to not list the contents of this directory. However I was on the right track. After all those attempts… what is the right way, on Visual Studio, to call an external web service, without WSDL, ASMX or adding a web reference? Turns out SOAP was really the way to go. The execution flow I used was: create a Web/SOAP request, set request method to POST (for some reason the 3rd party developed the webservices that way), convert the XML containing the WebService input into a byte array (payload), write the XML payload into the web request, use the web request to get a response from the WebService, return an XML with the WebService response (or an error XML). There’s an even better way here.